The little bee nuc is doing well! The last time I checked, they had capped the couple queen cells that had eggs in them, so I’m hopeful that there’s more than one queen developing. 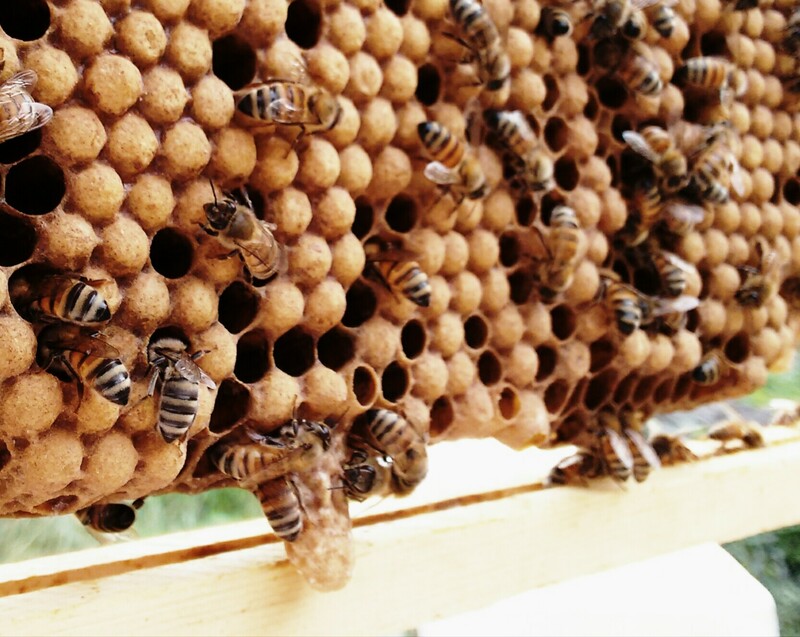 Whichever queen survives ought to emerge next weekend and start laying in another week or two. So I’ll wait to look for eggs until about the first week of August sometime. swarm queen cells generally hang from the bottoms of frames. Oh and I meant to show you this frame structure. 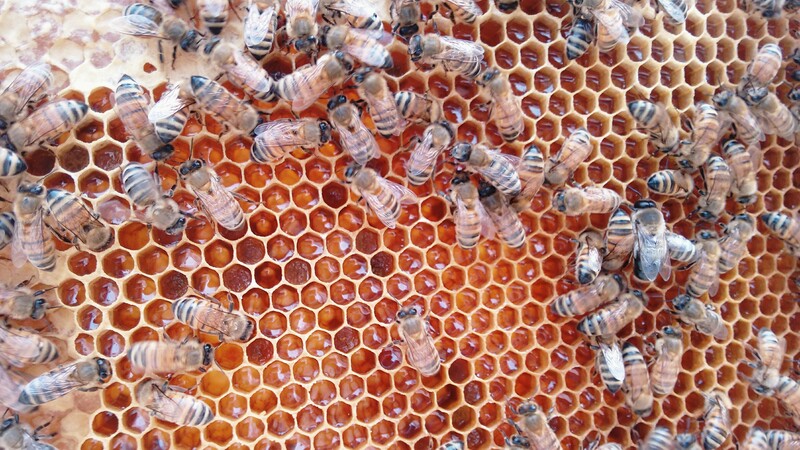 Bees make two kinds of cells: worker (female) cells and drones (males). Since all manmade foundation is made of worker sized cells, often bees will fill all kinds of crazy cracks with drone cells anywhere they can all through the hive. Many beekeepers spend a lot of time cutting this out and “cleaning up” the hive. 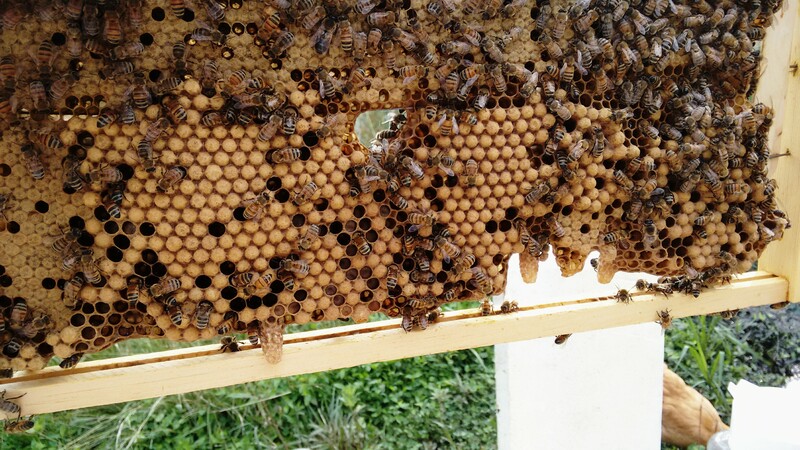 But if you don’t provide bees with nice straight foundation to start from, they’ll most likely make really strange convoluted comb all over the place, so you can’t move frames and inspect for disease, etc. So what I’ve done here is cut a sheet of foundation in half, and allowed the bees to draw their own foundation to fill in the rest of the frame. This ought to satisfy their urge to draw drone comb all over and do what comes most naturally to them. (Not my idea – it’s sort of just an adaptation of top-bar beekeeping. I used to do only top-bar beekeeping, but the energy expended in wax production is so significant that now I try to do a mixture of foundation and top-bar, to help the girls along). It’s awfully considerate of these bees to have built both the drones and the queen cells on the same frame for me, isn’t it? Made transfer quite easy. They are absolutely sucking down sugar syrup, about half a gallon every day or two, and busily putting away food stores. Man, I wish I could get a taste, but these bees are now racing against time to put away enough stores to survive the winter. Hopefully they do survive and start off next year nice and strong, to make a nice honey surplus for me. And actually, that reminds me, they may be making too much honey and clogging up spaces that the queen will need for laying. In fact, I should have checked this weekend to see if they needed more frames of brood. Oops. But I was kind of mad at them, since last night as I was fixing up the duck waterer – in the dark, with a headlamp, well away from the hives – one of them came at me and stung my cheek! It was only a glancing sting, as I seem to have crushed her before she could deliver all the venom, but wth girls? I’ve never known bees to fly in the dark before! Ungrateful little jerks. This entry was posted on Monday, July 20th, 2015 at 9:35 pm	and is filed under homesteading, bees. You can follow any responses to this entry through the RSS 2.0 feed. You can leave a response, or trackback from your own site. Atom, Entries (RSS .92), (RSS 2.0) and Comments (RSS 2.0). 26 queries. 0.240 seconds. Top.